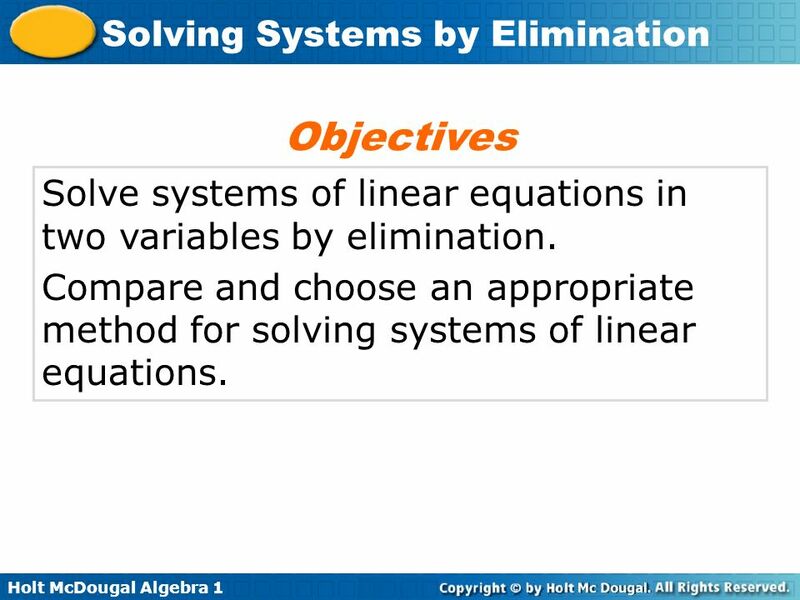 3 Objectives Solve systems of linear equations in two variables by elimination. 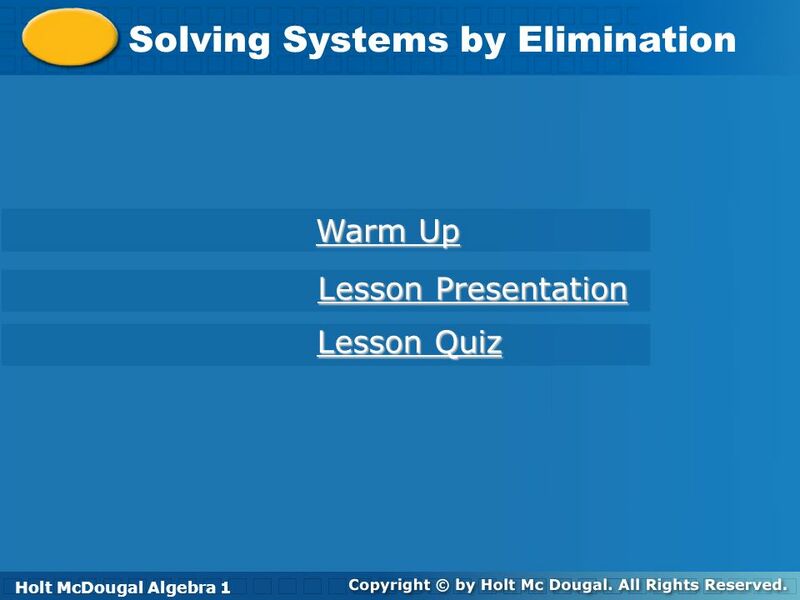 Compare and choose an appropriate method for solving systems of linear equations. 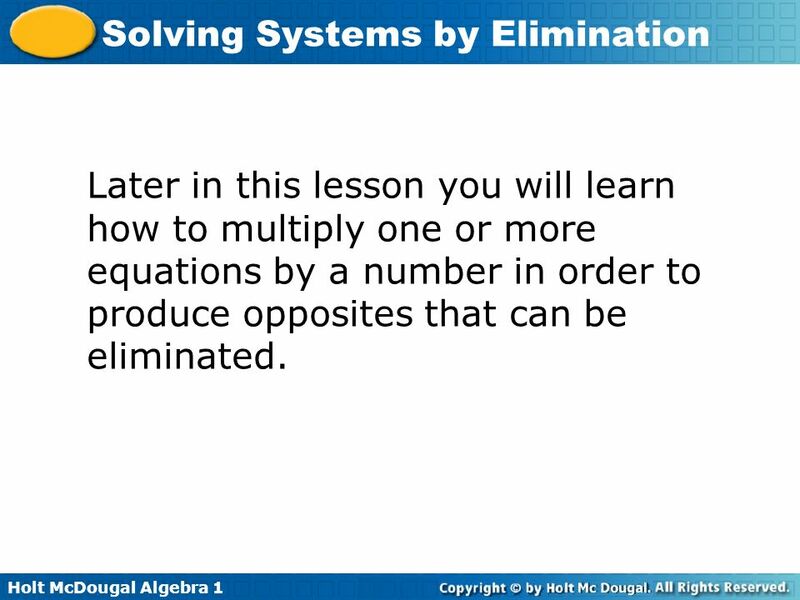 Another method for solving systems of equations is elimination. 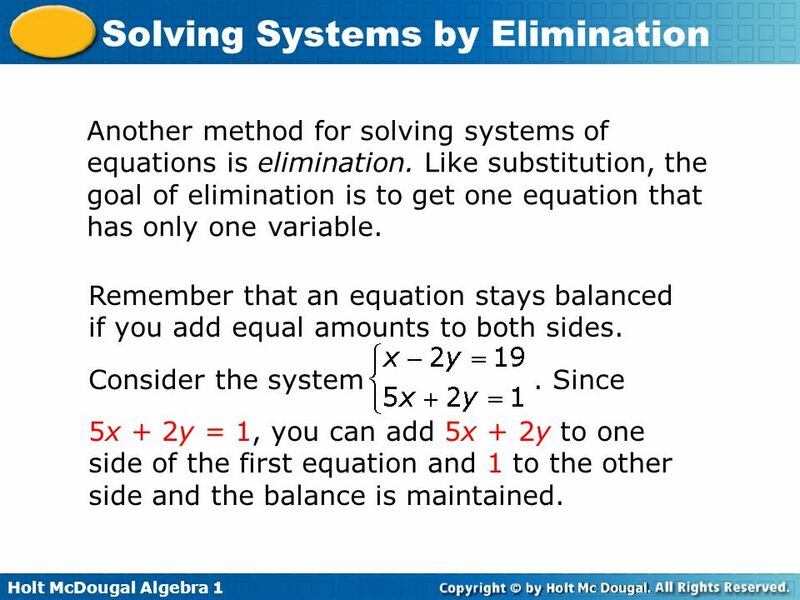 Like substitution, the goal of elimination is to get one equation that has only one variable. Remember that an equation stays balanced if you add equal amounts to both sides. 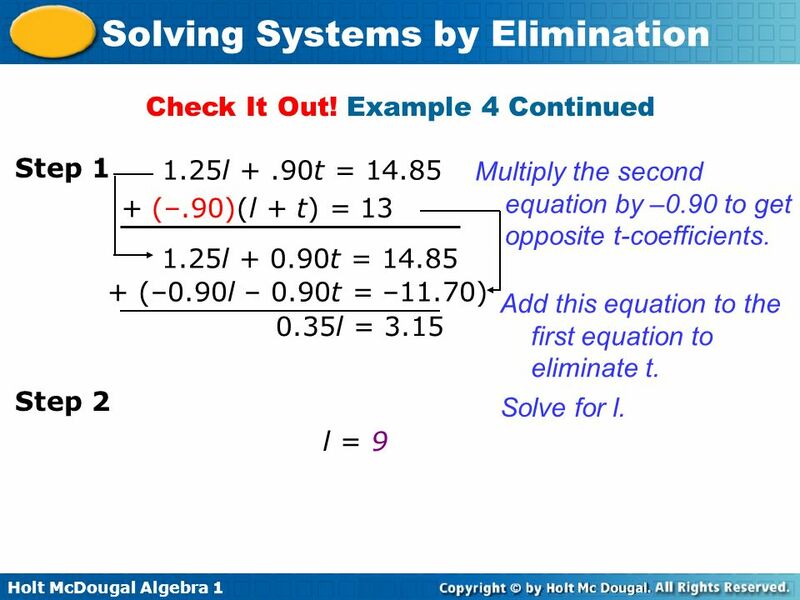 Consider the system Since 5x + 2y = 1, you can add 5x + 2y to one side of the first equation and 1 to the other side and the balance is maintained. 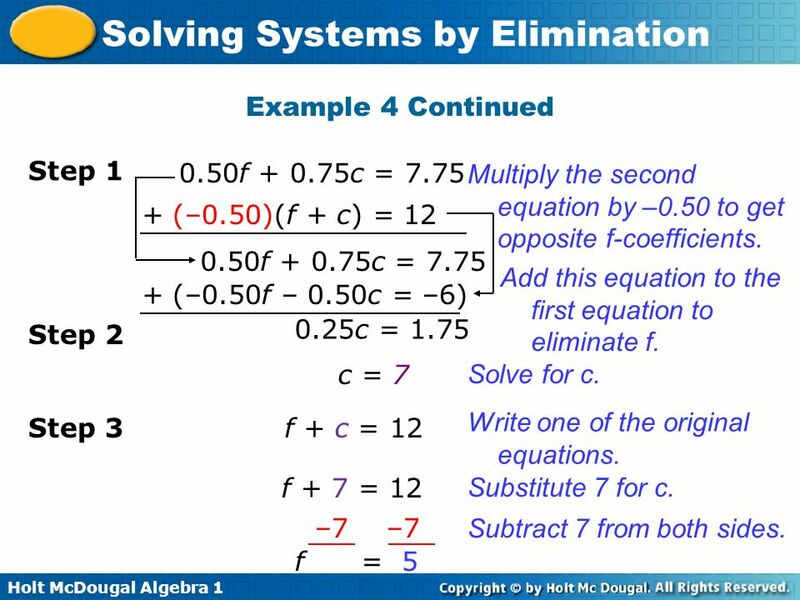 5 Since –2y and 2y have opposite coefficients, you can eliminate the y by adding the two equations. The result is one equation that has only one variable: 6x = –18. 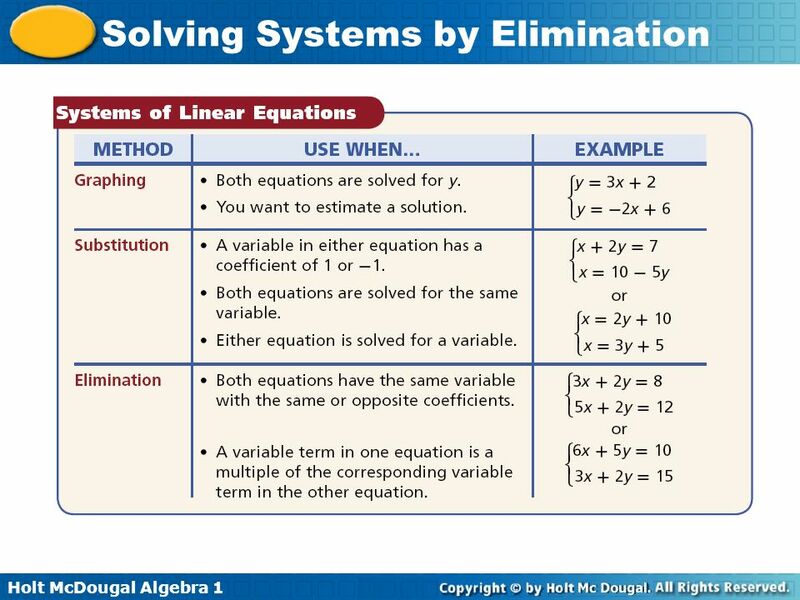 When you use the elimination method to solve a system of linear equations, align all like terms in the equations. 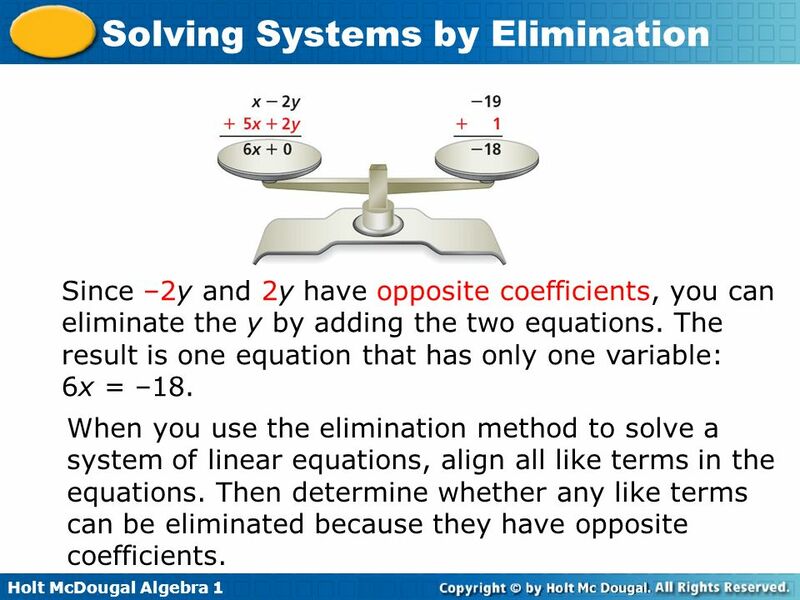 Then determine whether any like terms can be eliminated because they have opposite coefficients. 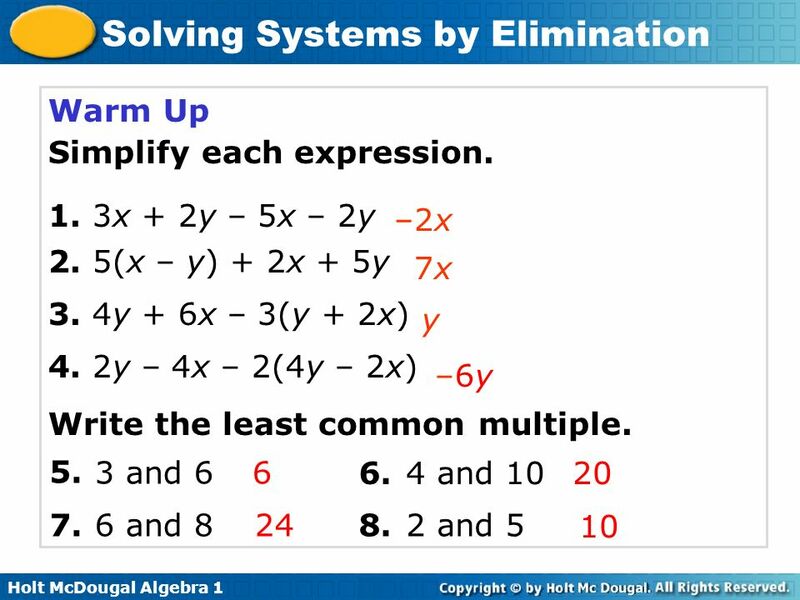 7 Later in this lesson you will learn how to multiply one or more equations by a number in order to produce opposites that can be eliminated. 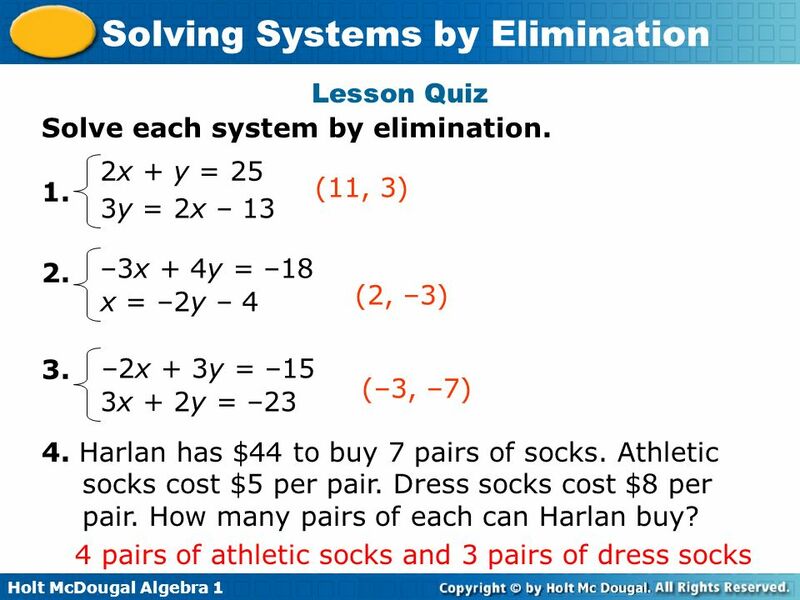 3x – 4y = 10 Solve by elimination. x + 4y = –2 Step 1 3x – 4y = 10 Align like terms. −4y and +4y are opposites. 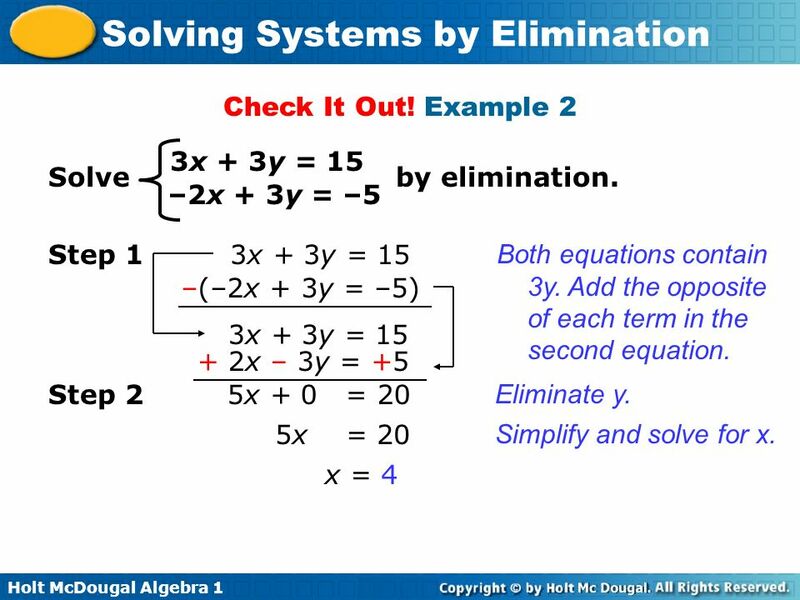 x + 4y = –2 Step 2 Add the equations to eliminate y. 4x = 8 4x = 8 Simplify and solve for x. 4x = 8 x = 2 Divide both sides by 4. 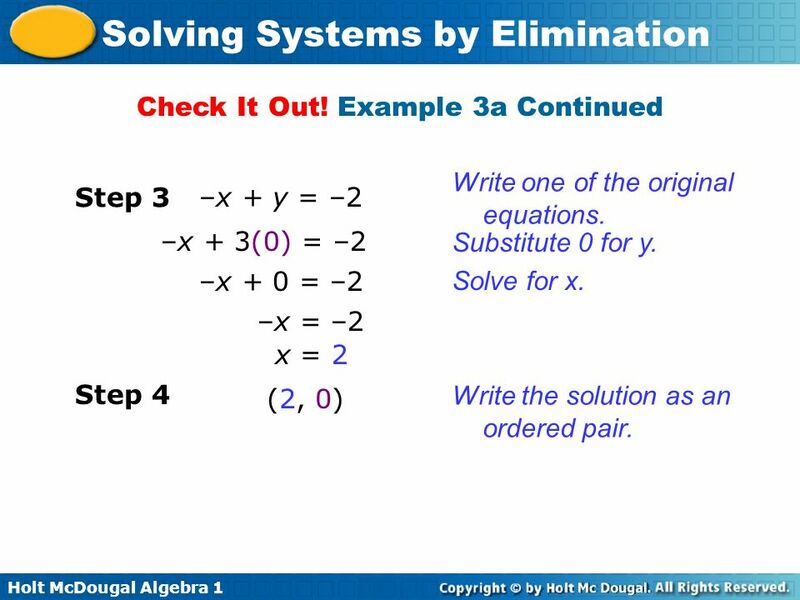 9 Example 1 Continued Step 3 x + 4y = –2 Write one of the original equations. 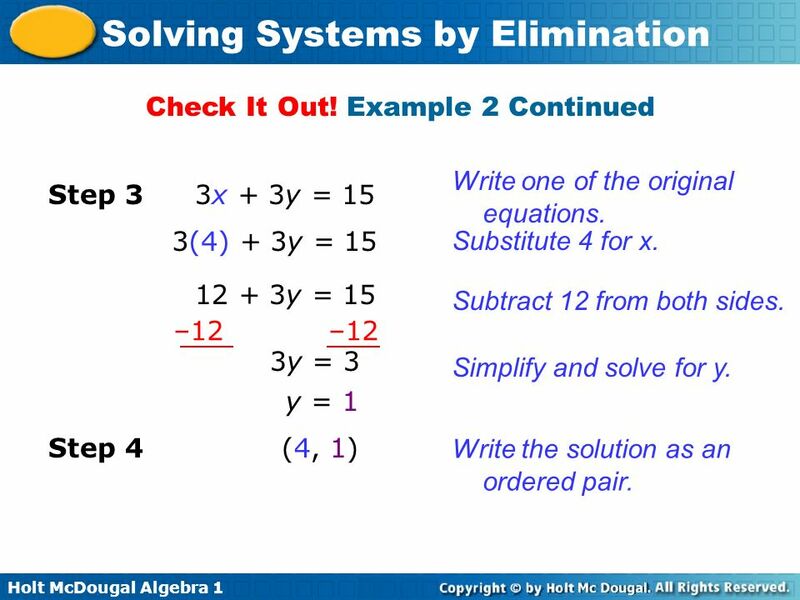 2 + 4y = –2 Substitute 2 for x. – –2 4y = –4 Subtract 2 from both sides. 4y –4 y = –1 Divide both sides by 4. 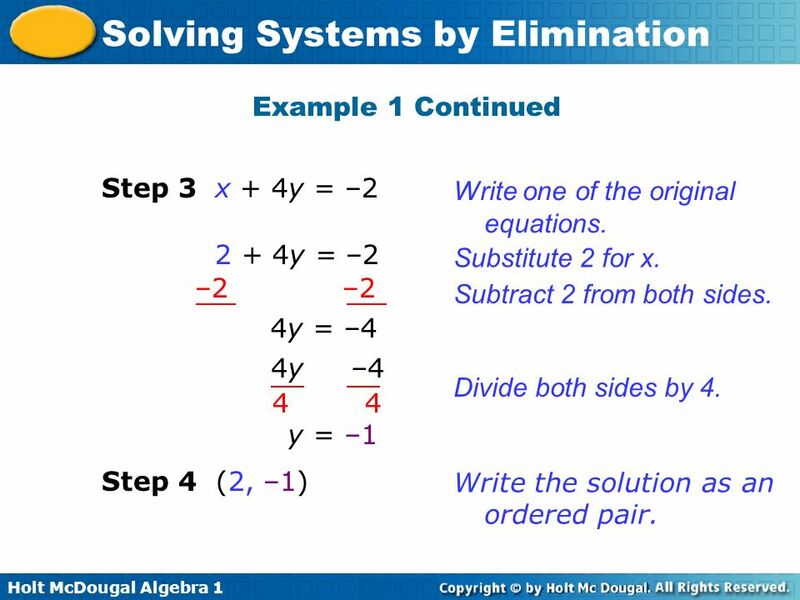 Step 4 (2, –1) Write the solution as an ordered pair. 10 Check It Out! 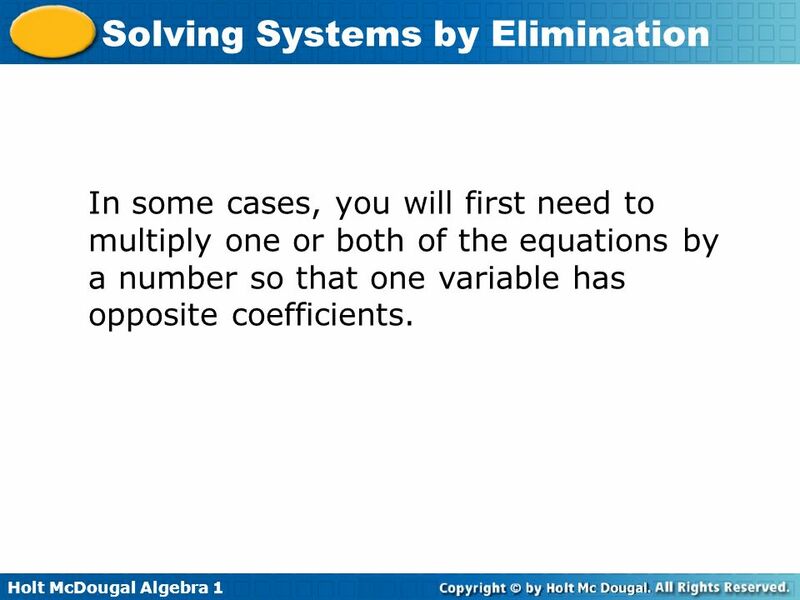 Example 1 y + 3x = –2 Solve by elimination. 2y – 3x = 14 Align like terms. 3x and −3x are opposites. 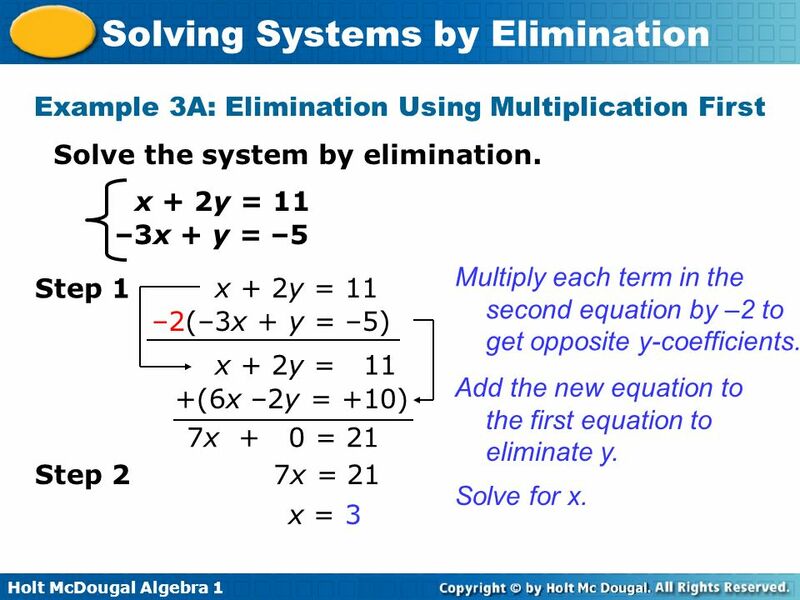 Step 1 2y – 3x = 14 y + 3x = –2 Add the equations to eliminate x. Step 2 3y = 12 3y = 12 Simplify and solve for y. y = 4 Divide both sides by 3. 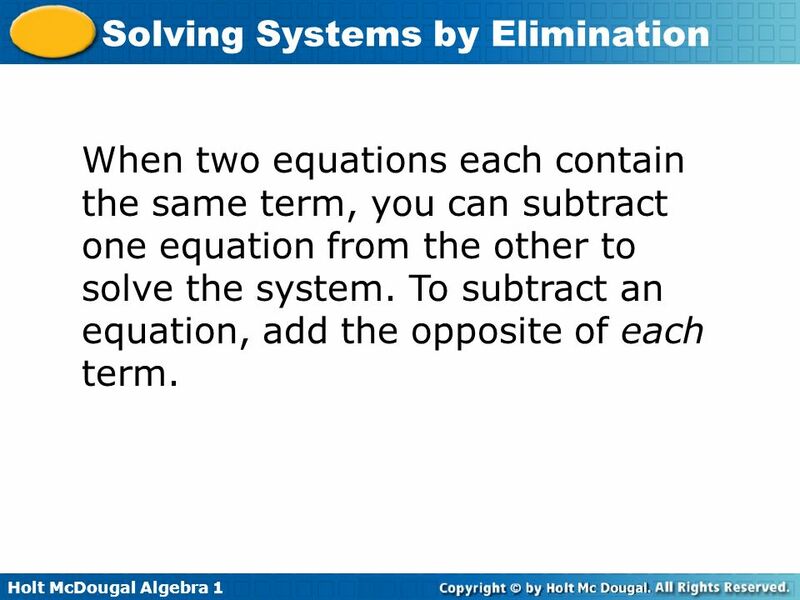 12 When two equations each contain the same term, you can subtract one equation from the other to solve the system. To subtract an equation, add the opposite of each term. 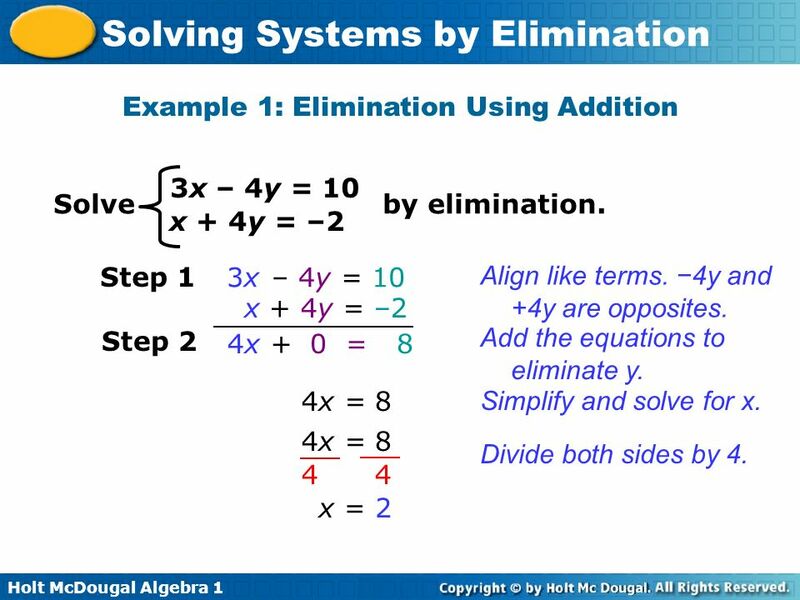 2x + y = –5 Solve by elimination. 2x – 5y = 13 2x + y = –5 Step 1 Both equations contain 2x. Add the opposite of each term in the second equation. 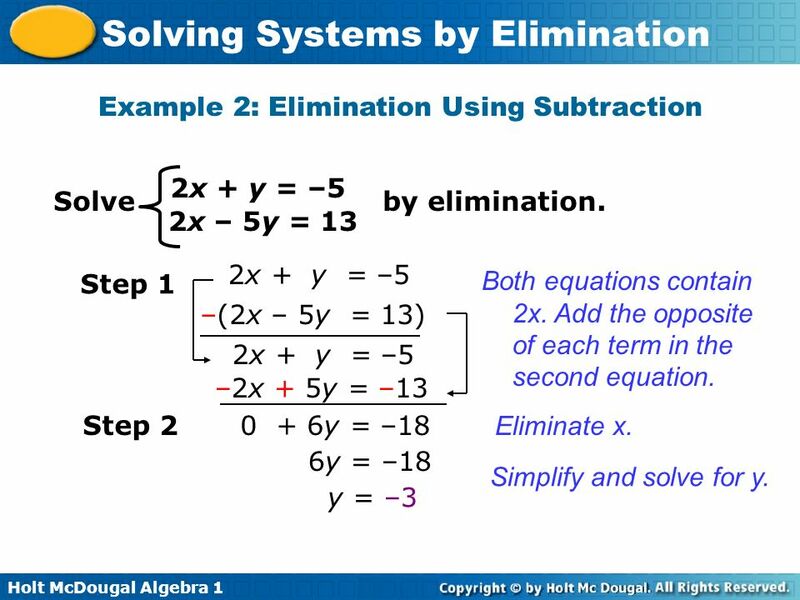 –(2x – 5y = 13) 2x + y = –5 –2x + 5y = –13 0 + 6y = –18 Step 2 Eliminate x. 6y = –18 y = –3 Simplify and solve for y. 14 Example 2 Continued Write one of the original equations. 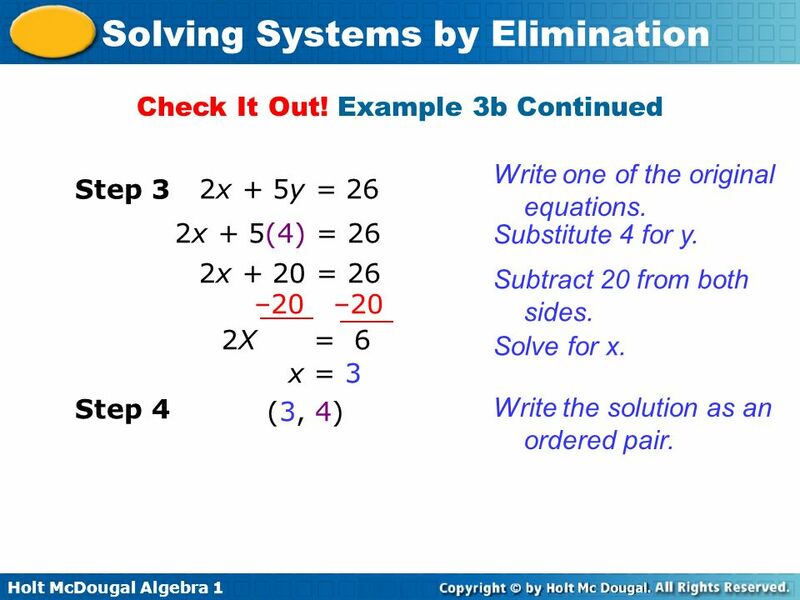 Step 3 2x + y = –5 2x + (–3) = –5 Substitute –3 for y. 2x – 3 = –5 Add 3 to both sides. 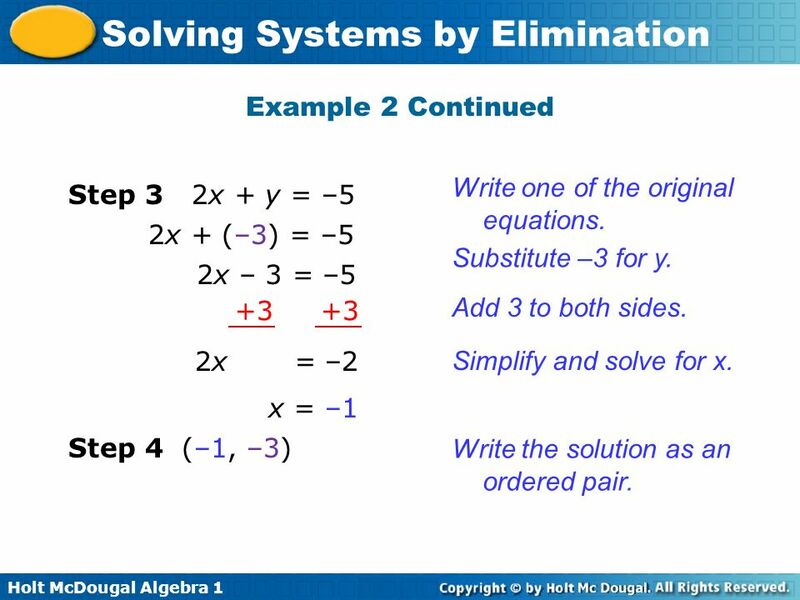 2x = –2 Simplify and solve for x. x = –1 Step 4 (–1, –3) Write the solution as an ordered pair. 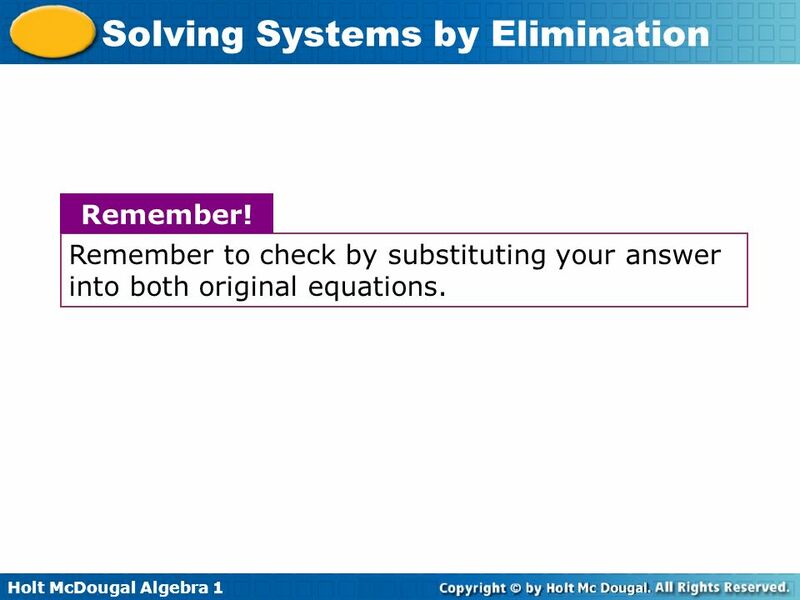 15 Remember to check by substituting your answer into both original equations. 16 Check It Out! 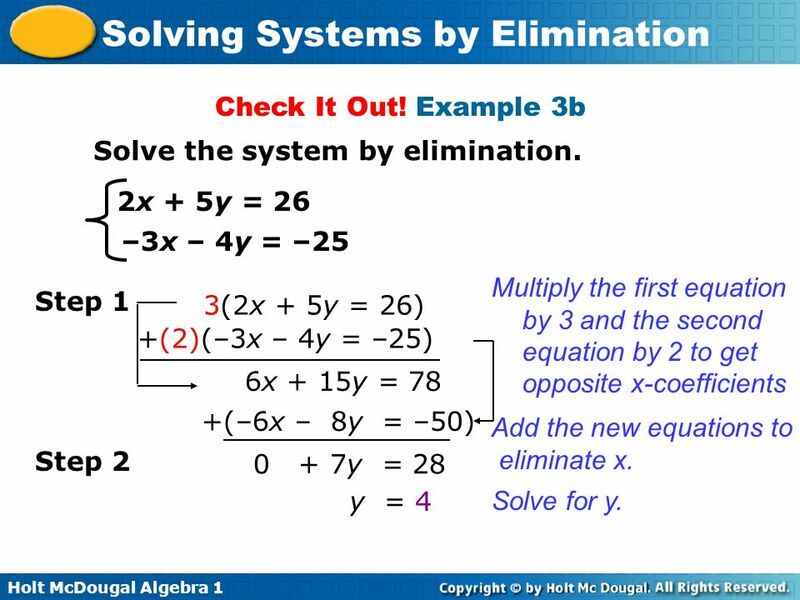 Example 2 3x + 3y = 15 Solve by elimination. 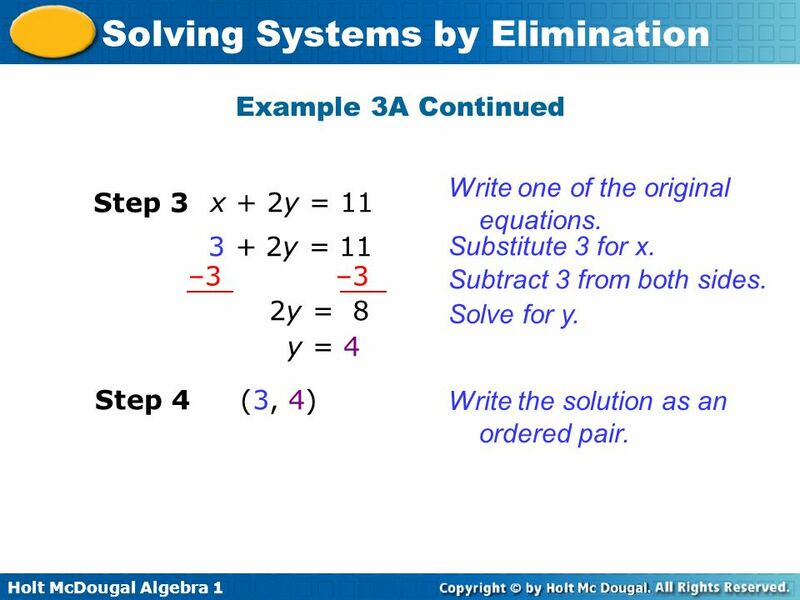 –2x + 3y = –5 3x + 3y = 15 –(–2x + 3y = –5) Step 1 Both equations contain 3y. Add the opposite of each term in the second equation. 3x + 3y = 15 + 2x – 3y = +5 Step 2 5x = 20 Eliminate y. 5x = 20 x = 4 Simplify and solve for x. 18 In some cases, you will first need to multiply one or both of the equations by a number so that one variable has opposite coefficients. 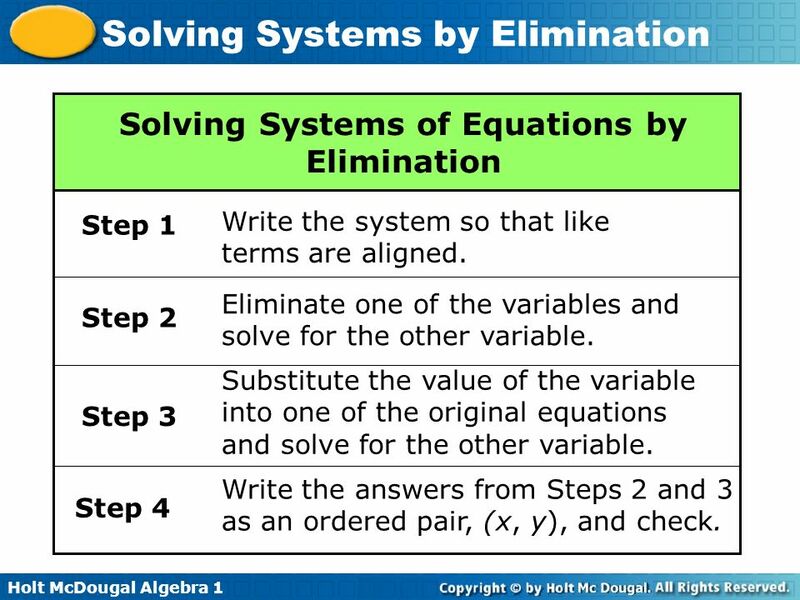 Solve the system by elimination. x + 2y = 11 –3x + y = –5 Multiply each term in the second equation by –2 to get opposite y-coefficients. x + 2y = 11 Step 1 –2(–3x + y = –5) x + 2y = 11 +(6x –2y = +10) Add the new equation to the first equation to eliminate y. 7x = 21 Step 2 7x = 21 x = 3 Solve for x. 20 Example 3A Continued Write one of the original equations. 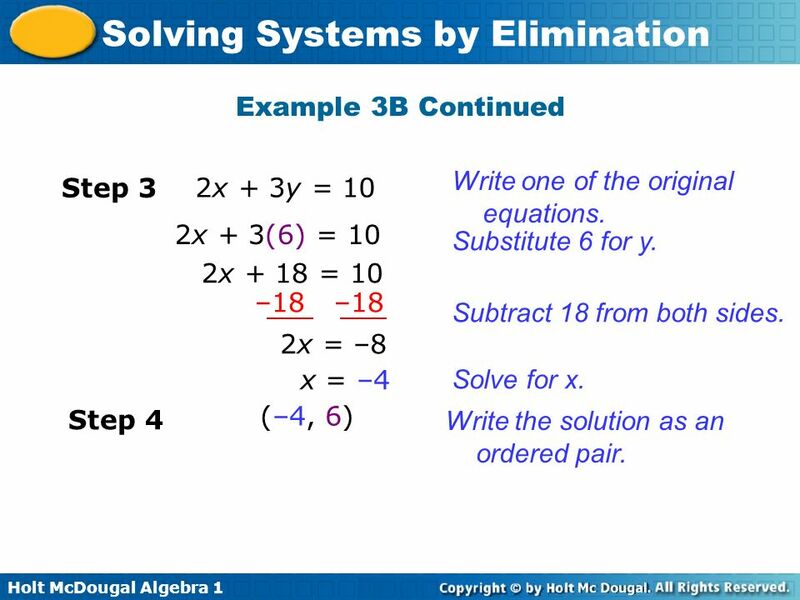 Step 3 x + 2y = 11 3 + 2y = 11 Substitute 3 for x. – –3 2y = 8 Subtract 3 from both sides. 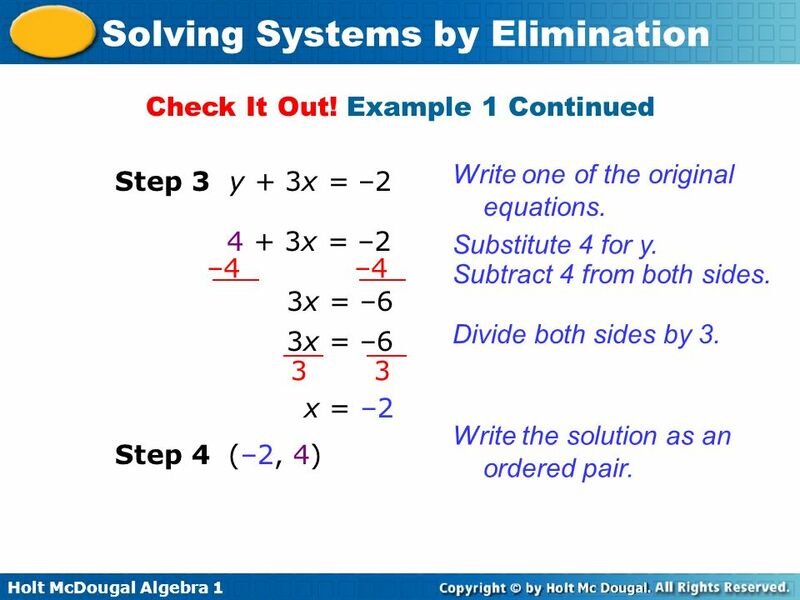 Solve for y. y = 4 Step 4 (3, 4) Write the solution as an ordered pair. 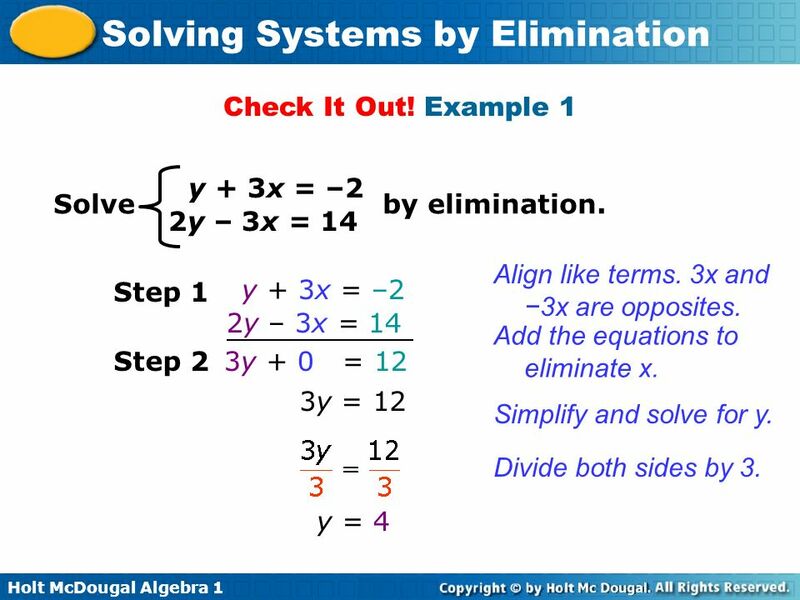 Solve the system by elimination. –5x + 2y = 32 2x + 3y = 10 Multiply the first equation by 2 and the second equation by 5 to get opposite x-coefficients Step 1 2(–5x + 2y = 32) 5(2x + 3y = 10) –10x + 4y = 64 +(10x + 15y = 50) Add the new equations to eliminate x. Step 2 19y = 114 y = 6 Solve for y. 25 Check It Out! 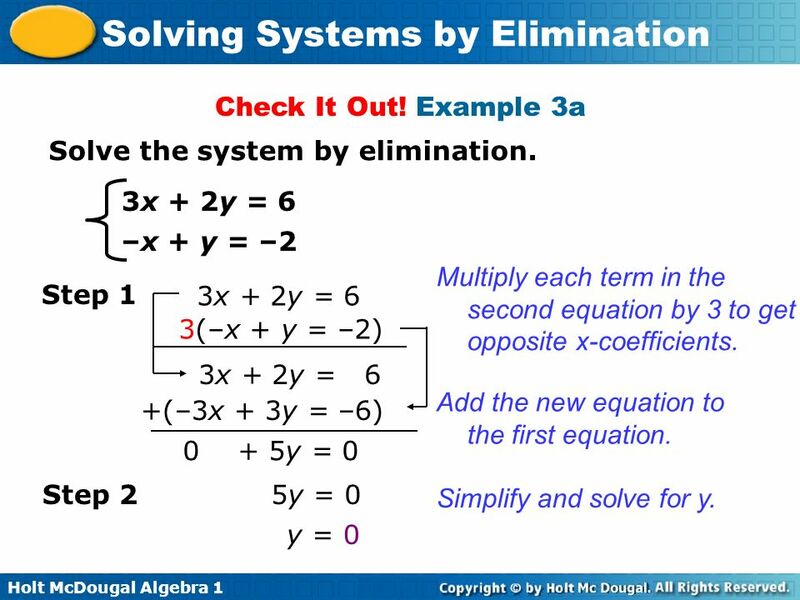 Example 3b Solve the system by elimination. 2x + 5y = 26 –3x – 4y = –25 Multiply the first equation by 3 and the second equation by 2 to get opposite x-coefficients Step 1 3(2x + 5y = 26) +(2)(–3x – 4y = –25) 6x + 15y = 78 +(–6x – 8y = –50) Add the new equations to eliminate x. y = 28 Step 2 y = 4 Solve for y. 27 Example 4: Application Paige has $7.75 to buy 12 sheets of felt and card stock for her scrapbook. The felt costs $0.50 per sheet, and the card stock costs $0.75 per sheet. How many sheets of each can Paige buy? Write a system. Use f for the number of felt sheets and c for the number of card stock sheets. 0.50f c = 7.75 The cost of felt and card stock totals $7.75. 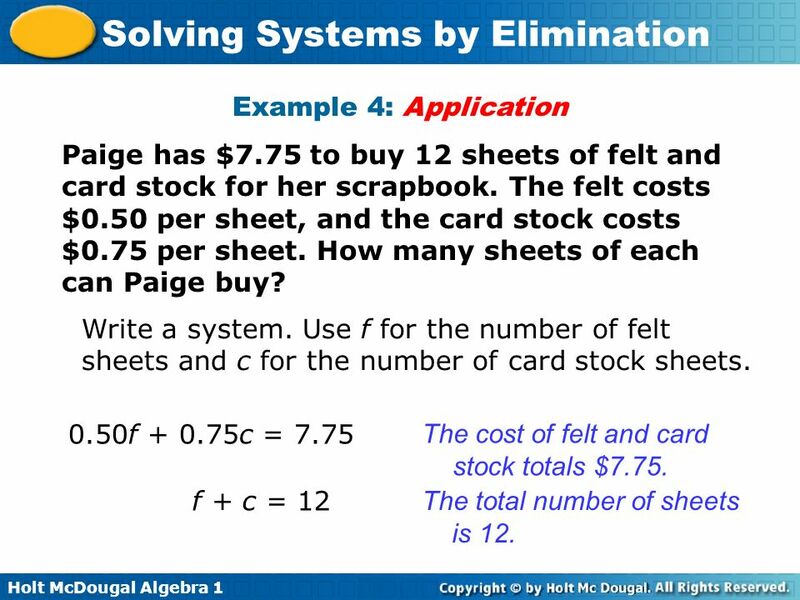 f + c = 12 The total number of sheets is 12. 28 Example 4 Continued Step 1 0.50f c = 7.75 Multiply the second equation by –0.50 to get opposite f-coefficients. + (–0.50)(f + c) = 12 0.50f c = 7.75 Add this equation to the first equation to eliminate f. + (–0.50f – 0.50c = –6) 0.25c = 1.75 Step 2 c = 7 Solve for c. Write one of the original equations. Step 3 f + c = 12 f + 7 = 12 Substitute 7 for c. –7 –7 f = 5 Subtract 7 from both sides. 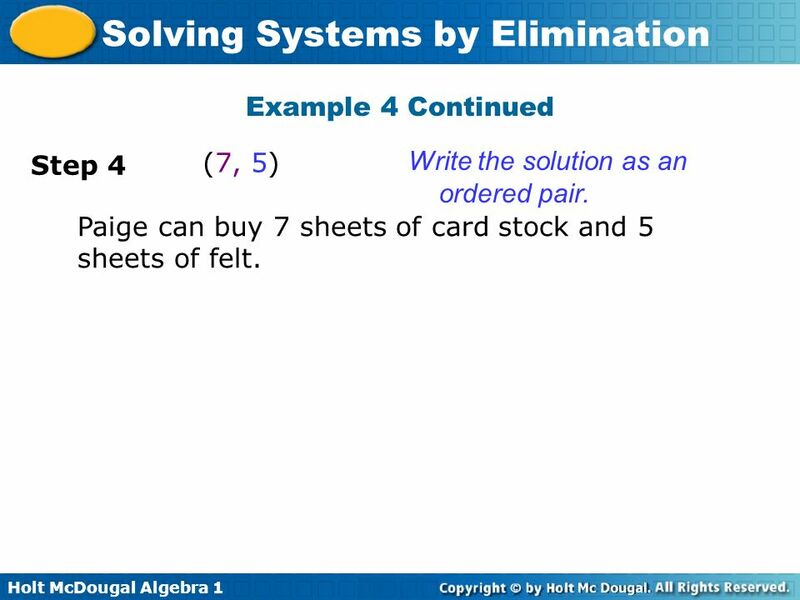 29 Example 4 Continued Step 4 (7, 5) Write the solution as an ordered pair. Paige can buy 7 sheets of card stock and 5 sheets of felt. 30 Check It Out! Example 4 What if…? 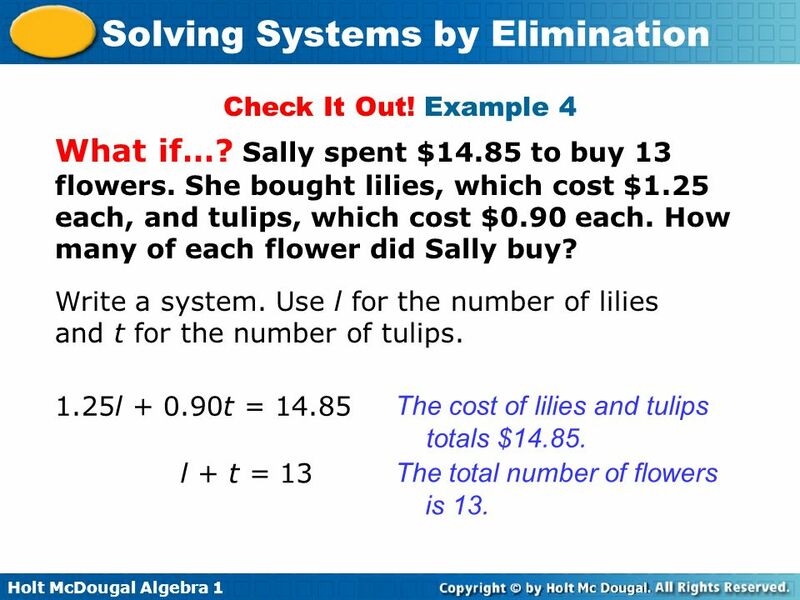 Sally spent $14.85 to buy 13 flowers. She bought lilies, which cost $1.25 each, and tulips, which cost $0.90 each. How many of each flower did Sally buy? Write a system. Use l for the number of lilies and t for the number of tulips. 1.25l t = 14.85 The cost of lilies and tulips totals $14.85. l + t = 13 The total number of flowers is 13. Step 3 Write one of the original equations. l + t = 13 9 + t = 13 Substitute 9 for l. – –9 Subtract 9 from both sides. 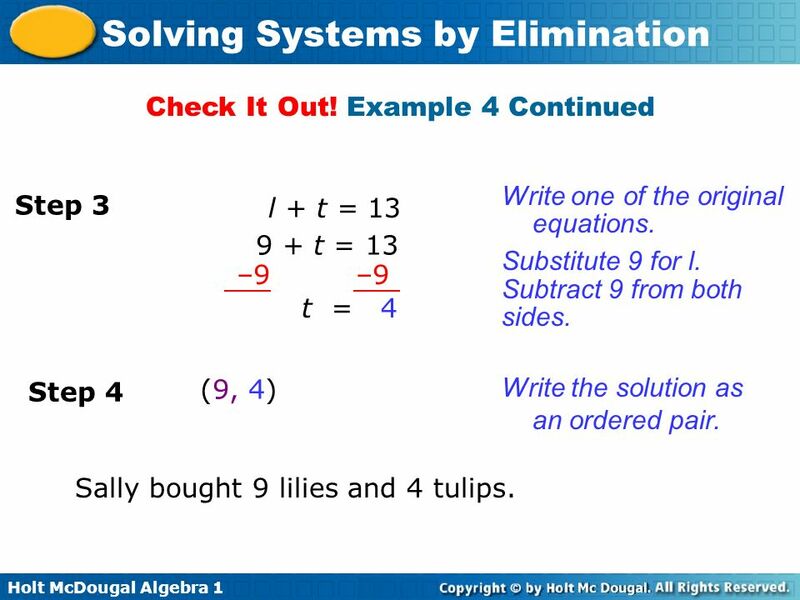 t = 4 Step 4 (9, 4) Write the solution as an ordered pair. Sally bought 9 lilies and 4 tulips. All systems can be solved in more than one way. For some systems, some methods may be better than others. 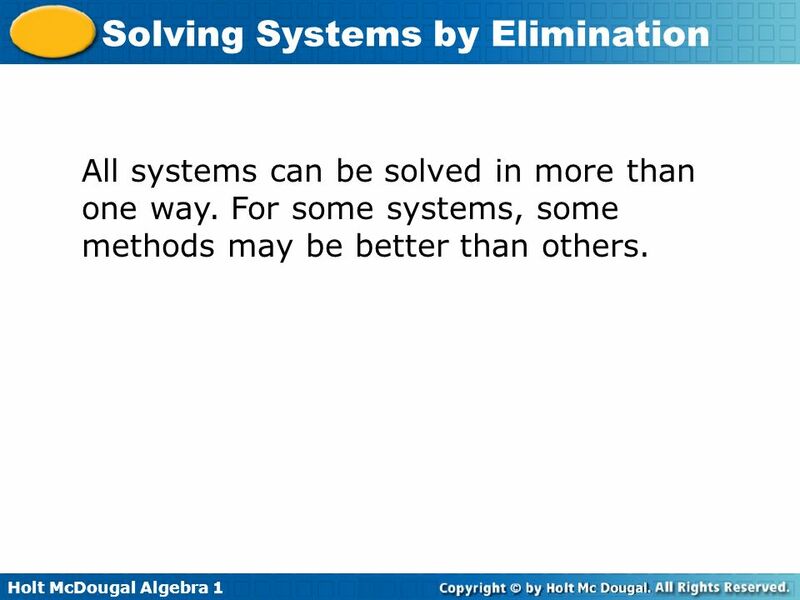 Download ppt "Solving Systems by Elimination"